Earwax, also known by the medical term cerumen, is a yellowish waxy substance secreted in the ear canal. It protects the skin of the human ear canal, assists in cleaning and lubrication, and also provides some protection from bacteria, fungi, insects and water. Earwax consists of shed skin cells, hair, and the secretions of the ceruminous and sebaceous glands of the outer ear canal. Major components of earwax are long chain fatty acids, both saturated and unsaturated, alcohols, squalene and cholesterol. Excess or compacted cerumen can press against the eardrum or block the outside ear canal or hearing aids, potentially causing hearing loss by impeding the passage of sound in the ear canal, causing conductive hearing loss. Hearing aids may be associated with increased earwax impaction. It is also estimated to be the cause of 60–80% of hearing aid faults. Micro-Suction is the safe, modern method of earwax removal as recommended by the NHS. It is suitable for perforated ear drums. 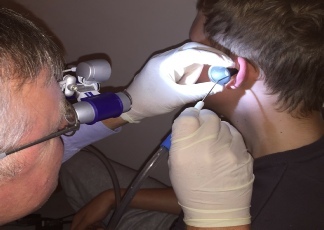 Firstly the outer ear is examined to determine the extent of the wax build up and a picture taken which the patient is welcome to view. The earwax is removed via a small suction tube (no water is used) and a further image taken of the cleared canal. Disposable equipment is always used.